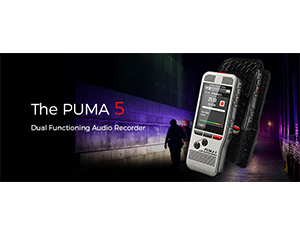 The PUMA 5 builds upon our fine reputation as specialists in digital recorders for Law Enforcement. It is the First and Only Dual-Functioning Digital Audio Recorder for Law Enforcement. Effortlessly switch between Contact, Tactical and Dictation modes in order to document interactions with the public, record covert situations or dictate police reports on the go. The PUMA 5 delivers on many of the same features that have made PUMA Recorders the preferred recorder for Law Enforcement, including Simple one button recording, secure and non-editable recording modes and a customized Leather or Molle Style Holster. New to the PUMA 5 is All-Metal construction, Rechargeable Batteries, Large Record Indicator Light, Standard MP3 audio format and Optional Encryption. In addition, the PUMA 5’s Dual-Functioning modes allow officers to switch between “Contact” to “Tactical Mode” for covert recording situations and “Dictation Mode” for dictating police reports on the go. The PUMA 5 comes with a range of high-quality accessories and holster options to create our Law Enforcement Package. The package includes a custom designed Leather or Molle Style KYDEX holster. Add on a Remote Switch, tie clip microphone, telephone recording device, docking station and other accessories to make this a perfect fit for your department. With the new PUMA 5 recorder, Versatile Information Products, Inc. has once again set the standard for portable audio recording products for Law Enforcement Agencies. From activation to upload, the PUMA 5 truly revolutionizes the Audio Recorder!